Montblanc has launched Lady Emblem, the feminine counterpart to 2014's Emblem. Lady Emblem is a floral fragrance born out of the essence of rose, the universal synonym of elegance and femininity. The top notes are a shining blend of mesmerising sake notes, sparkling pink pepper and juicy pink grapefruit. The heart is a bouquet faceted around floral voluptuous jasmine notes and the precious fresh petal Rose Essential™ with sparks of pomegranate for a bittersweet fruity touch. The drydown features creamy elegant sandalwood and warm amber notes illuminated by musk crystals for a dazzling signature. 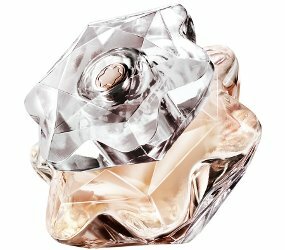 Montblanc Lady Emblem is available in 30, 50 and 75 ml Eau de Parfum. I’m bewildered by that bottle. It’s really nice working, but I’m having a hard time understanding how it works. Not a fan of the name. It sounds like a euphemism for, er, something else! Yeah, should have went with the name Femmeblem. ;). I literally just started watching The White Queen and this bottle reminds me of the rose motifs in the opening credits. In real life the bottle is awesome as on the photo. The juice is rosy, in the style of Chloes des Roses, but sweeter a bit. Nice fragrance for a present.